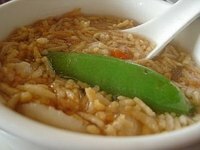 Sizzling rice soup is a traditional Chinese dish with chicken, vegetables and crunchy rice. To make the rice crunchy, prepare it before making the soup. Cool the rice, bake it in the oven and then fry it on the stovetop to create the crispy rice that makes this Chinese soup a delicious meal. Experiment by using different meats or vegetables to create a soup that will appeal to you and your family. Place 1 cup of rice and 2 cups of water into a saucepan. Heat the water and rice over high heat until it boils. Cover the pan and reduce the heat to simmer for approximately 20 minutes. Remove the saucepan from the heat when the water is absorbed and the rice is cooked. Grease the baking sheet with vegetable oil and spread the warm rice onto the baking sheet in a single layer. Bake the rice at 325 degrees Fahrenheit for two hours. Stir the rice several times during the baking time and remove the rice from the oven when the rice is dry and golden brown. Set the baking sheet aside. Cut the chicken breasts into bite-size pieces and place into the stockpot. Slice 2 cups of mushrooms and add to the stockpot. Add 8 cups of chicken stock, the water chestnuts, the bamboo shoots, and 1/2 tsp. of garlic powder to the stockpot. Place the stockpot onto the stove on medium heat. When the ingredients simmer, turn the heat down to low and simmer the soup for one hour. Pour the package of peas into the hot mixture and continue simmering for five more minutes. Remove the stockpot from the heat. Chop the green onions and add to the soup. Pour 1/4-cup of vegetable oil into the frying pan and heat the oil over medium heat. Add the rice to the hot oil. Cook and stir the rice for several minutes until it puffs up. Serve the soup in bowls and add some puffed rice to the top of each bowl of soup. As you add the rice to the soup, it will sizzle invitingly.